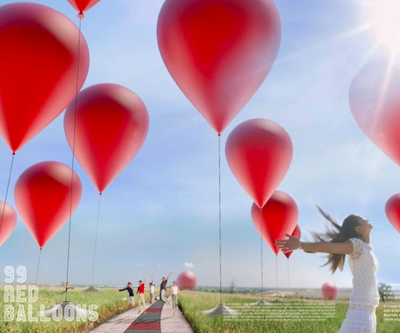 Inspired by the German pop song from the eighties “99 Luffballoons”, a Canadian urban design company created a concept installation piece of 99 giant, red balloons to produce clean, solar-generated energy – enough to power 4,500 homes. The huge inflatables, which are also solar power generators, are lined with transparent organic solar cells, reports Arch Daily. This allows them to turn from solid red to transparent when its solar harvesting system is activated. The award-winning project by Winnipeg-based urban design company Nadi Design Studio was intended to mark landfills. The idea, said the artists, was both to bring attention to the waste issue and to propose a new source of clean energy.